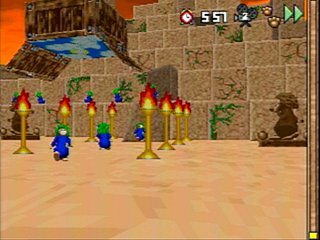 3D Lemmings (the North American version is referred to as Lemmings 3D) is a puzzle video game released in 1995, developed by Clockwork Games and published by Psygnosis. The gameplay, like the original Lemmings game, requires the player to lead all the lemmings to their exit by giving them the appropriate "skills". It was the first Lemmings game to be rendered in 3D. It was released for DOS, PlayStation, and Sega Saturn.